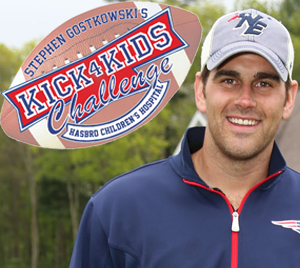 Join Stephen Gostkowski's Kick 4 Kids Challenge and be a hero for Hasbro! This football season, hometown kicker Stephen Gostkowski, along with Seasons Corner Market, will once again be heroes for Hasbro Children's Hospital! We hope you will join them. For every field goal made from Stephen, Seasons Corner Market will make a donation to Hasbro Children’s Hospital. Thanks to Stephen's generosity, your gift will be matched, making it go twice as far! You'll be supporting the children and families of Hasbro Children's Hospital and you will be eligible for some special thank you gifts if you donate at the following levels. Every month during the regular football season, one lucky person will have a chance to win one of the following special raffle prizes. Click here to enter the monthly raffle.